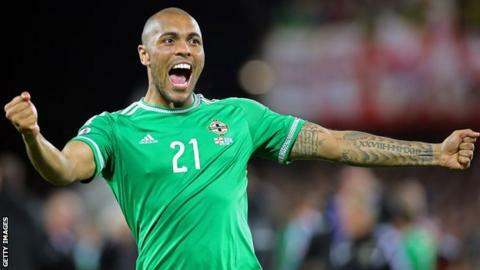 Northern Ireland striker Josh Magennis thinks Scotland would benefit by following his nation's example of sticking with their manager. Michael O'Neill has led his side to Euro 2016 in his second campaign. But Gordon Strachan is considering his future after Scotland missed out. Kilmarnock's Magennis hopes he stays for the 2018 World Cup qualifiers. He said: "I think Scotland are doing the right thing if they offer Gordon a new contract, because it takes time." Magennis' first international goal helped the Northern Irish secure their place in the finals with a 3-1 win over Greece on Thursday. And the 25-year-old Kilmarnock striker thinks theirs is a journey that Scotland could follow. "When Michael first came in, it was hard for him to get across what he wanted," Magennis told BBC Scotland. "We do have a lot of quality individuals who have played an extreme amount of games in the Premier League - Jonny Evans, Steve Davis, Gareth McAuley, Chris Brunt, Roy Carroll, the list goes on. "But there's one thing we have that other teams might not have in abundance and that's the willingness to fight for each other until the death. "When you've got that desire and hunger, combined with the quality we have in our team, it's a formidable force and we've proven it in this campaign." Magennis pointed out that O'Neill had his side playing to their strengths. "Most of the time it was at set-pieces," said the Kilmarnock striker. "When you have people in your team who can deliver set-pieces, like we have with Brunt and Oliver Norwood, and people who are willing to attack it like McAuley and Evans, even myself to an extent, it really opens up the locker. "We don't try to do anything that is not expected of us. We have a style of play and it works." Magennis only switched to being a striker seven years ago after being told by Cardiff City he would not make it as a goalkeeper. Even with previous club Aberdeen was often played at right-back. "It is so surreal," he said. "If someone had said write a book about yourself and go to the extremes, I don't think I could have imagined this would have ever happened." "The first time qualifying since the World Cup in 1986, first time ever to do it at the European Championships, it is still sinking in - it is absolutely fantastic." Northern Ireland need at least a point in Finland on Sunday to top Group F, assuming Romania win in the Faroe Islands. "It is the first time in history that a Pot 5 team can win their group and the first time in history that Northern Ireland can top their group and go on to a major tournament," added Magennis. "It is a dream come true."